To become a sponsor, volunteer, partner, or to donate, please click the link below, or contact us at 503-436-9301. The History Center is a non-profit organization, dedicated to preserving Cannon Beach history and increasing public awareness through education, outreach, and other types of programs. As a non-profit we depend on several key things to help us accomplish our mission: volunteers, donations and contributions, memberships in the Historical Society, and gifts to our collections. Volunteers are the heart and soul of the History Center and we simply couldn’t operate without them. Our volunteers have a great time working on our growing collection of artifacts, sorting and filing photographs, greeting visitors, developing and coordinating special events (such as our Cottage & Garden Tour), assisting with mailings and helping with the numerous other jobs that need to be done. If you’d like to volunteer, feel free call us at 503-436-9301, or you can email us at info@cbhistory.org. The History Center welcomes financial donations and contributions. Contact the Historical Society for more information on how we can work together to establish a gift that will suit your needs. Members make a difference! Not only do your membership fees assist the History Center in running its many programs, but as a member you receive advance news of upcoming events and wonderful discounts! Check out how you can become a member now! 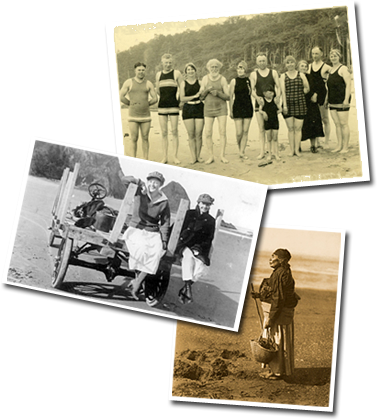 Do you have interesting Cannon Beach memorabilia, photographs, historical artifacts, theatrical programs, postcards or other ephemera that need a good home? CBHS is always interested in expanding our collections, and has a secure place to catalog and store collections. We are especially interested in building up printed resources — especially locally published newspapers and newsletters, which are needed to support historical research relating to Cannon Beach.